another question from my Blog reader: “How do you determine whether to create a task calendar or a resource calendar? For example I start off with setting up the project calendar as standard, and then I decide that a particular task needs to be worked on over a weekend. If my resources normally work the standard hours, do I create a task calendar? The answer is: It depends of your Task! Let me give you an example. 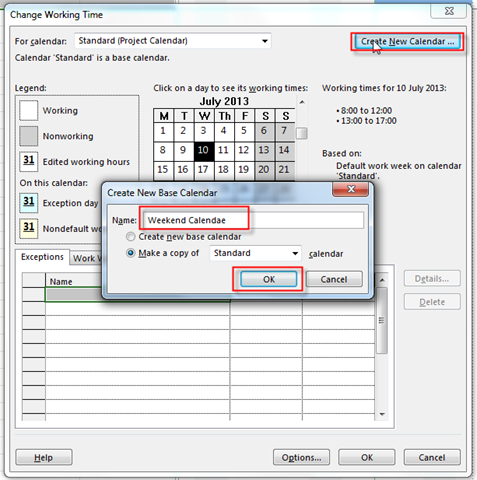 Resource Calendar has purpose to establish working time, and non working time for some resources. 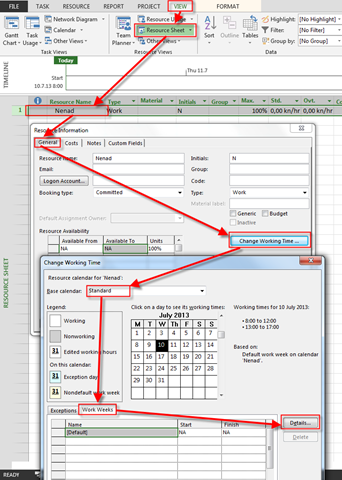 So when you assign Resources to some Tasks, Start and End Date depend of Resource Calendar. Let me show you that in MS PROJECT 2013. Let’ say that I have resource Nenad and that I’m freak, and I am going to work every day (including Saturday and Sunday). As you can see, Nenad will work at Wednesday, Thursday, Friday, Saturday and Sunday, but Mary will work at Wednesday, Thursday, Friday, Monday and Tuesday. And if you have this particular Calendar for Nenad it will be applied to all Tasks. Let me now say that I have Task called Weekend Task. And it has to be done only at Saturday and Sunday. Now I can assign Mary and I will have no warning! So, to conclude. 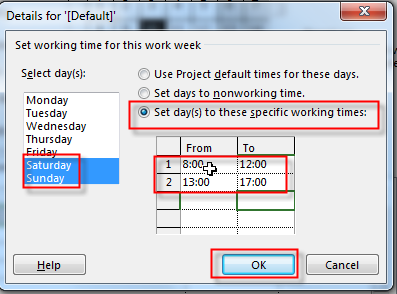 If you want some Task to be done on Particular days of the week, no matter of Resources, then yes, use Task Calendar! This entry was posted in MICROSOFT PROJECT, Microsoft PRoject 2010, Microsoft Project 2013, MS PROJECT 2010, PMI, PRoject Management and tagged Microsoft Project 2010, Microsoft Project 2013, Microsoft Project 2013 - Calendars. Bookmark the permalink. I’m new to MS Project and really appreciate information on this site. I have a question reqarding your post “Resource vs. 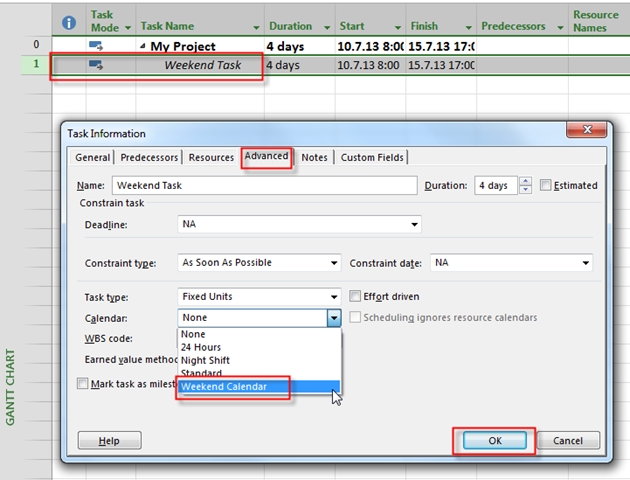 Task Calendar in MS PROJECT 2013” posted on July 10, 2013. 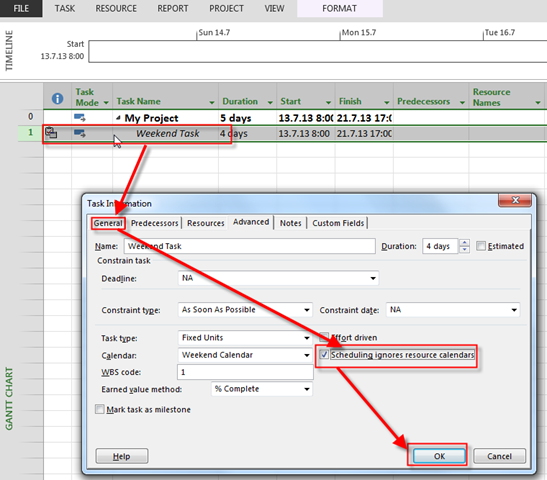 Please explain how were you able to schedule the Task for your resourse Nenad for Sat. 10/13 and Sunday, 10/14 even though both of those days were his working days? 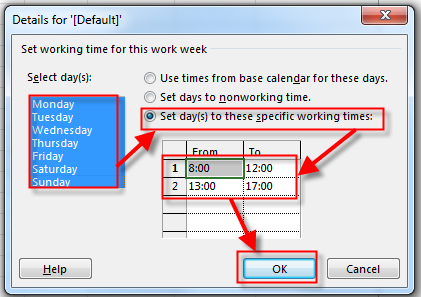 Isn’t the MSP scheduling rule states that in order to schdeule a task for an assigned resourse, the task and the resource should have COMMON working days, unless the optoion to ignore resource calendar is selected. In this case Saturday and Sunday of 10/13 and 10/14 respectively were set as working days for Nenad, bot set as non-working days for the task as it was useing a Standard calendar with non-working Saturdays and Sundays. I will make a post a blog about this. Hello! And many thanks for your blog! But if due to any reason, Mary can’t work in that specific weekend planned and must delay the work to another weekend? The only way is to go the the Details Exception and change it manually? This is the Best way! My problem is that some of resources have 2 work schedules. When they work on-shore (5 days week 8 hours day) and off-shore (7 days week and 11 hours day), For each work day off-shore they wave a rest day. But because off-shore conditions are very unpredictable and dates change often I wondered if there were another way. 4. 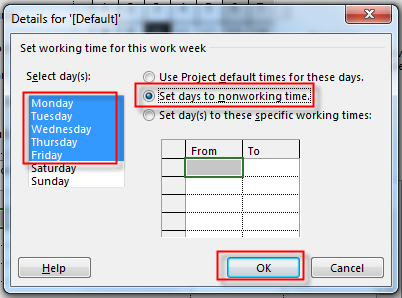 Go to details tab and specify working times. Then when you assign the resources to the task, say starting on a Monday for 7 days, it will allow the resources to work on the weekend. Is that an alternative to setting a task calendar? Yes it is alternative, but you should be careful because tht working time is aplicable not to just one Task but all Tasks in the same period for the same resource!